According to the calendar winter came in December as always. However, it has not been clearly defined by the CT weather, which has continued to be more fall-like with one early snow-storm in November, and lots of rain since. Temperatures have generally been in the 30’s or 40’s. It makes me nervous as to how January and February will shape-up. I hope you all had a wonderful Holiday season and that you enjoy winter as much as possible while we patiently wait for spring. The Holidays are a great time of year. Seeing family and friends, some for only the first or second time of the entire year, is a real treat. 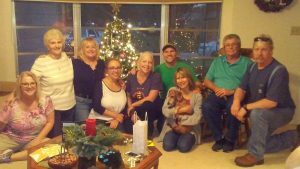 Sandra and I had opportunity to spend time with her local family, my Aunt and cousins in Florida (as seen in the photo), my brother and family in Baltimore, and of course, my Mom. A busy travel schedule, but well worth it. Holidays encourage family gatherings, and we’re happy for it. We hope you had happy family and friend gathering as well. The fourth quarter of 2018 was difficult for both markets and investors. The S&P 500 was down -13.52% for the quarter and -4.38% for the year. Global ex-U.S. was down -11.46% for the quarter and -14.20% for the year. Emerging markets were a bit better for the quarter, down -7.47% but for the year were down -14.58%. Unlike earlier in the year, bonds did offer some buffering to stocks with the Barclays bond index up +1.64% for the quarter, but only +0.01% for the year. Short-term treasuries were up +0.60% for the quarter and +1.89% for the year. In my opinion, the market moves in the fourth quarter were irrational, driven not by fundamentals, but by emotion. After hitting an all-time high on September 20, the market started a rapid decline just a few days later on October 3. I find this behavior to be similar to what we saw in late January 2018 where we hit an all-time high, then just days later went on a -11% correction. The markets were volatile afterwards (as they are now) then stability returned, and markets increased to the new high in September. We are not in a recession, nor are we close to one. In fact, corporate earnings are strong, wages are up, employment is up, and consumer spending is strong. There was no way to predict this rapid change of market behavior, so be careful not to let emotion drive investment decisions. I believe waiting for stability will pay-off. Not unlike my comments last quarter, we are not on the verge of recession. I am now more confident that we won’t see a slowdown or recession until 2020. Yes, that slowdown is coming, but it is not here yet. And the economic fundamentals suggest this recent market behavior makes no sense. Does that mean that we will head right back to those late September highs? No. My guess is that it will take the markets three to nine months to stabilize, then we should see market levels somewhere between the late September highs and the lows established during this correction. I mentioned above that bonds offered some buffering to the recent market correction. That was a change from earlier in the year when bonds were under constant pressure based on the Federal Reserve (Fed) raising short-term interest rates. The recent word from the Fed is that they will be cautious with further rate increases. The Fed must be careful because long-term rates are not increasing and if they continue to increase short-term rates, the risk of short-term rates rising above long-term rates (a condition known as inversion) becomes a real possibility. The Fed does not want to create inversion. I believe that is good news for bonds. My investment strategy is to add to U.S. value investments and continue to underweight international investments. I will continue to overweight emerging markets and add to bond positions given recent conditions. I will move away from U.S. growth and inflation protected bonds as there is no sign of future inflation. I will continue holding equity long/short as an alternative as it was a big help during the recent market volatility.